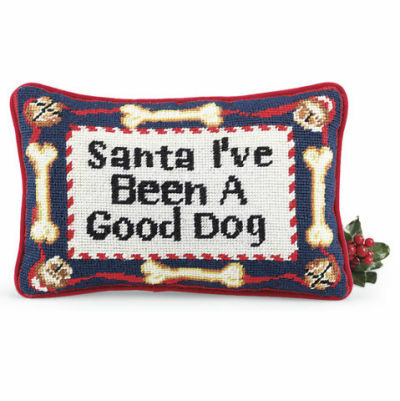 This adorable needlepoint throw pillow makes your pup's final plea for Christmas gifts by stating "Santa I've Been A Good Dog". The simple statement is outlined with cute dog bones and jingle bells. The wool needlepoint front gives this fun pillow a classic old-fashioned appearance that makes it all the more endearing. For more information about the Santa I've Been A Good Dog pillow, click here.